Four goals from Colin Heath helped Knaresborough Town thrash in-form Campion by a 6-1 scoreline in NCEL Division One. 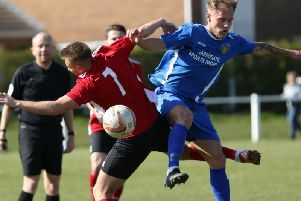 Paul Stansfield’s high-flyers turned on the style as they came from behind to claim a comprehensive victory against a side unbeaten in their previous eight league matches. Such a resounding success did not look likely early on as the home team got off to a flying start. Town goalkeeper Jack Rushworth was forced into action to deny Eli Hey, the league’s top scorer, in the opening minutes, but just 60 seconds later, a long ball caught the visitors’ defence cold and Steve Hollingworth ran through to round Rushworth and fire home. Soon afterwards, Hollingworth had a chance to make the score 2-0, but this time Rushworth saved and Matt Donnelly was able to clear. Knaresborough then settled and Seb Carole fired wide in their first attack as they gradually clawed their way back into the game. Brad Walker beat his marker on the left in the 13th minute and when Campion stopper Danny Armitage pushed out his low centre, Heath was on hand to tap home the equaliser. Carole then had a shot saved before Hollingworth fired wide at the other end during a long spell of even play in which Knaresborough, playing up the hill and against the wind, never appeared to be in any great difficulty. A fine passing move involving Carole and Jonty Maullin then allowed Heath through on the right and, after his initial effort was saved, he was able to slide home a second shot from a very narrow angle to make it 2-1. Buoyed by claiming the ascendancy, Knaresborough ended the half well on top as Heath had a further shot deflected wide and Maullin headed over from a Carole corner. A crucial third goal arrived four minutes after half-time when Walker chased a ball into the left corner of the penalty area before turning and crossing for Heath to head home his hat-trick goal. The same player then ran on to a Dan McDaid through-ball in the 67th minute and although Armitage saved his shot, the ball bounced back into the striker’s path, allowing him to head over the exposed gloveman for his side’s fourth of the day. Maullin shot over the bar following a corner and blocked strikes from Donnelly and Sam Cook, but then Armitage sent a clearance straight to Carole some 45 yards from goal and the winger hit a finely-judged shot back over the keeper’s head and into the net for 5-1. Heath then turned provider as he set up the sixth for Carole in the 78th minute, and almost hit a further goal himself soon afterwards. Rushworth had to be alert to save twice late on, but Town held out without conceding again to register a fine result. Victory leaves Stansfield’s charges fourth in the first division standings, just three points off the top of the table.